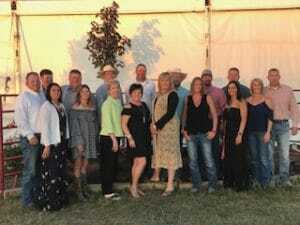 Derek and Allison Sandman were asked to host the 2019 Cattlemen’s Ball and with the help of Wayne and Chris Krausnick, it will be hosted on their land near Enders Dam, on the Frenchman River. We are excited to bring this event to Southwest Nebraska and the surrounding communities to raise money for cancer research, showcase rural Nebraska, and promote beef in a healthy diet. We have teamed up with Steve and Char Wallin, Ryan and Stephanie Stromberger all of Imperial; Shawn, Julie, and Grant Jones of Benkelman; Nick and Kati Ladenburger of Stratton; Mick and Marlene Cox of Hayes Center; and Joey and Myra Large of Wauneta to showcase our beautiful southwest Nebraska and roll out the carpet for a successful 2019 Cattlemen’s Ball. We are excited to enlist the help of our great residents of our surrounding communities. There are many avenues for anyone to get involved, donate money, sponsor an event, participate in Calf 4 a Cure, and volunteer your time, energy, and ideas! Please review the past programs to get a feel of how you can serve, help and donate to the 2019 Cattlemen’s Ball.